Seville is…special. Somehow, when I start telling people about places I love in the world, Seville usually makes the list. It’s probably not in the top 10, but it’s always up there. And there’s good reason for it – the city’s UNESCO World Heritage Sites, the Alcazar and the Seville Cathedral, are both important and beautiful. 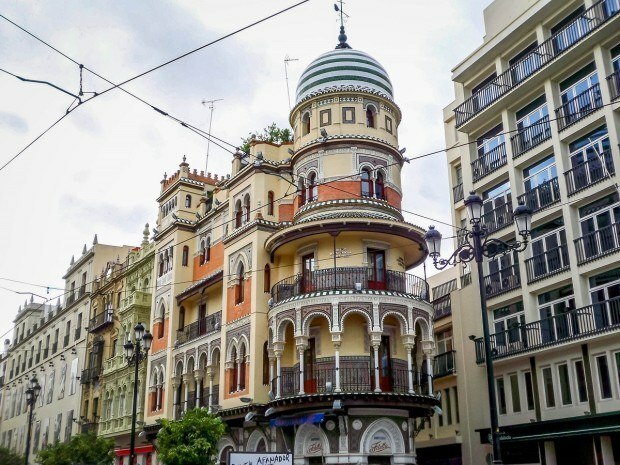 Seville is in the south of Spain and the capital of Andalucía. It is also a cultural center within Spain that is without rival. The city has fluctuated between Arab/Moorish and Christian control over the centuries leaving a distinct architectural style. 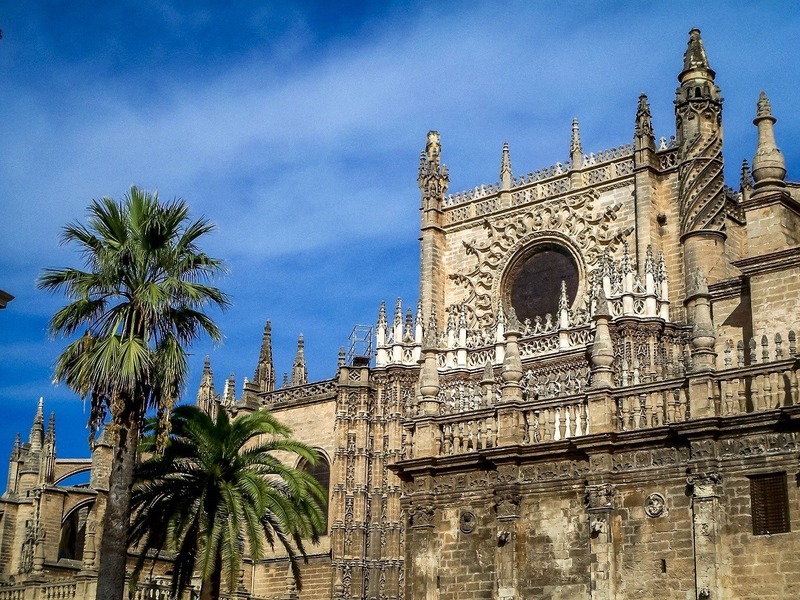 Seville was also the launch point for Christopher Columbus’ journey to the New World. 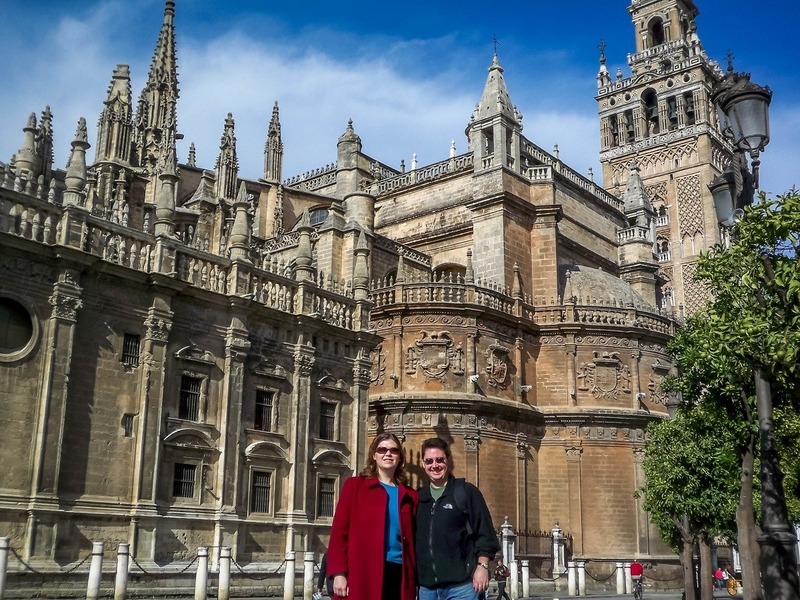 We started our exploration of Seville on the banks of the slow moving Guadalquivir River. Seville’s early importance came from this river. It served as the city’s port and also made it an early trading capital in the world. 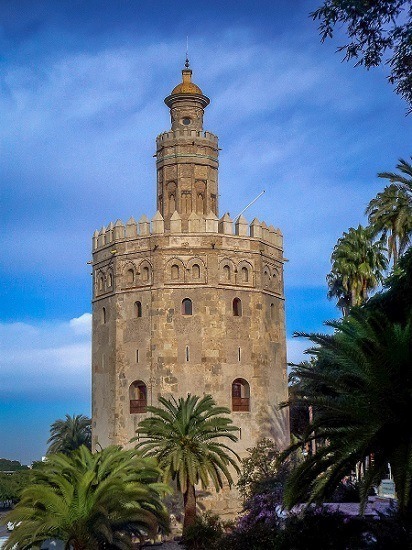 We discovered the large Torre del Oro (the Golden Tower) – a tall building topped with a single eye. At one time, this is where Christopher Columbus and other explorers left to the New World. It’s now the city’s maritime museum. We found a bench and sat under a palm tree staring at the building for a while. It truly is one of the most unique and beautiful building’s we’ve ever seen. To learn about the city, we went up to the Plaza Nueva for a walking tour. We met with local guide Concepion Delgado of Sevilla Walking Tours to get an overview of the city, and some of that local intelligence we always love! The tour took us to the Cathedral of Santa Maria de la Sede and the Giralda Bell Tower (which was originally a Moorish minaret). The Cathedral, built atop a former mosque in 1403, is the largest Gothic building in Europe. It is massive! 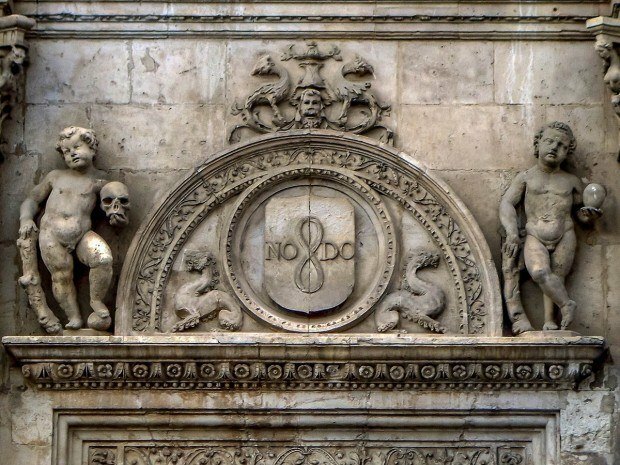 The Seville Cathedral claims to hold the final resting place of Christopher Columbus – and has erected suitably ostentatious statue of 4 kings to carry his tomb. In retrospect, we now know that Christopher Columbus didn’t discover the New World (the Vikings were there long before), he did open up trade and travel between the two continents, for which we are extremely grateful! After, we wandered up to the Alcazar. 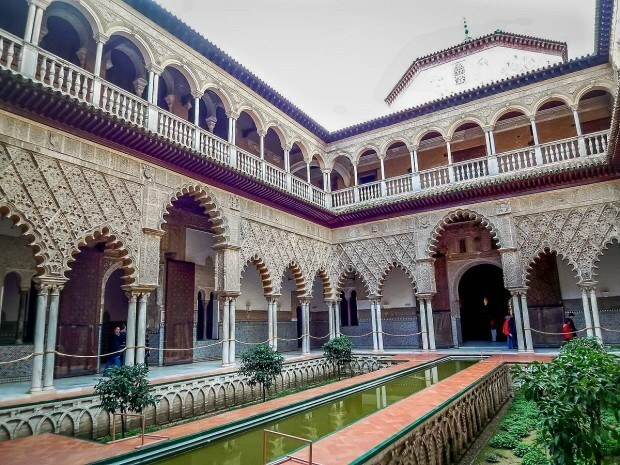 The Seville Alcazar, like the Alhambra in Granada, is a beautiful royal palace built in the Moorish style. 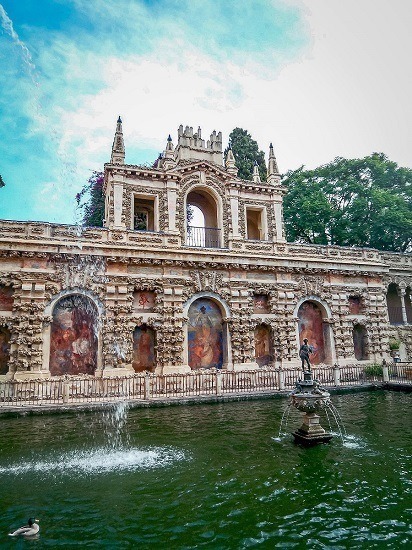 It actually incorporates an original Moorish palace that was used by the local governor. The current Real Alcazar palace and gardens are still used by the Spanish royal family for events. Our Seville walking tour ended in the Barrio Santa Cruz neighborhood. Here, narrow lanes are filled with restaurants and cafes, along with souvenir and craft stores. This was a pleasant end to our day – just strolling and being in the moment of Seville’s beauty. It seems like going to a flamenco show is on every visitor’s list. We were no exception. The show at Los Gallos came highly recommended. It was a great show of music, dancing and singing from 22:30-00:30 (€35.00 includes the cover charge). The place was only about 15% full, but I bet it is packed during peak season. The show was all things Spanish – soulful, graceful, flashy and evocative. I don’t know if would do this often and it’s probably considered pretty touristy, but we loved it. Churros and chocolate just go together. 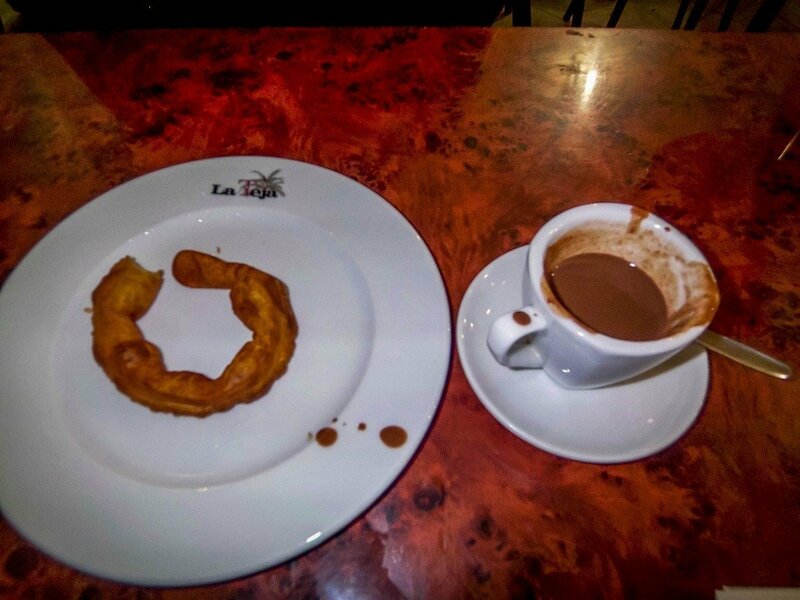 In Seville, we tried them at the Bar Mesor Caselleros off Jovellanos near the Calle Sierpes. The churros are fresh earlier in the day, so don’t come late. This is the ultimate Spanish snack. The local drink to try is the Vino de Naranja – or orange wine. 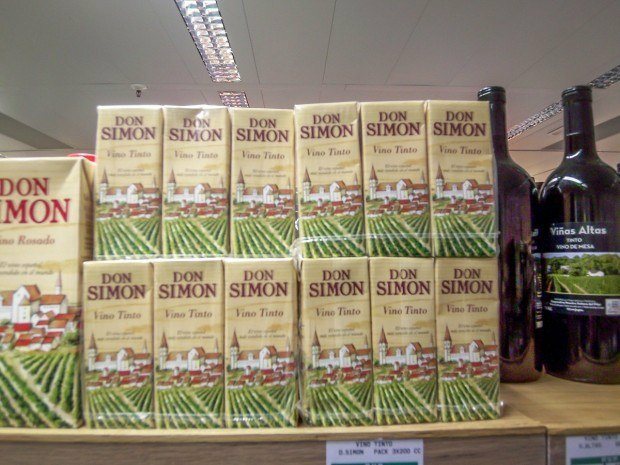 This sweet dessert wine is a Seville specialty and many little bars serve it. We discovered it at the Bar Alvaro (next to Sacristia). The Vino de Naranja was a remarkable find. We used some of our hotel loyalty points and stayed at the Hotel Alfonso XIII, a Luxury Collection property from Starwood. Let’s just say they don’t get a lot of folks coming in with backpacks! This is high society Europe without being stuffy. And it is chic and sophisticated without the formalities. It is, quite simply, the nicest hotel I’ve ever stayed at. The rooms have marble floors and tapestries on the walls. It was wonderful beyond words. 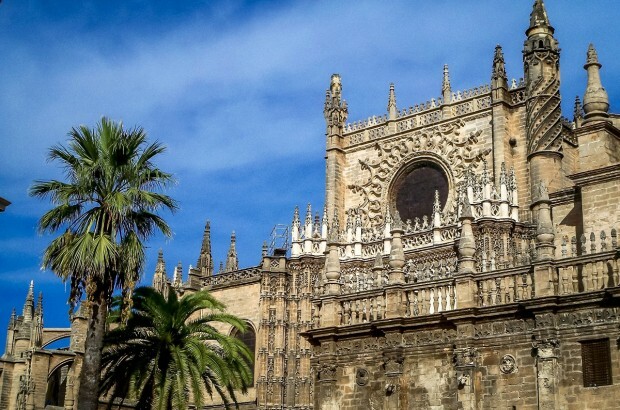 What do you think about Seville’s Alcazar and Cathedral? Nobody “discovered” the New World. People already lived there. The Europeans invaded and occupied it. Everyone came from somewhere else, so someone discovered it. There have been multiple waves of exploration (or what you call invasion and occupation). There was never an indigenous New World human population before the last Ice Age (i.e., Beringia). There are no native Americans. The waves of exploration and human migration have been (in reverse chronological order): African (forcible), European/Post-Columbian, Columbian, Pre-Columbian/Viking, Siberian/Paleo-Indian, etc. So while there have been peoples who have been here much, much longer than others, everyone actually came from somewhere else (borne out in both the archaeological and the genetic evidence). The point of that sentence is the one you are making: Contrary to what they say in Seville, Columbus didn’t discover the New World.